The three panels show a 1986 test of a Tomahawk cruise missile. The missile traveled 640 km (400 mile) low over the terrain to detonate above the target, a decommissioned fighter plane. It’s pretty clear the test was a success. Now look carefully there. 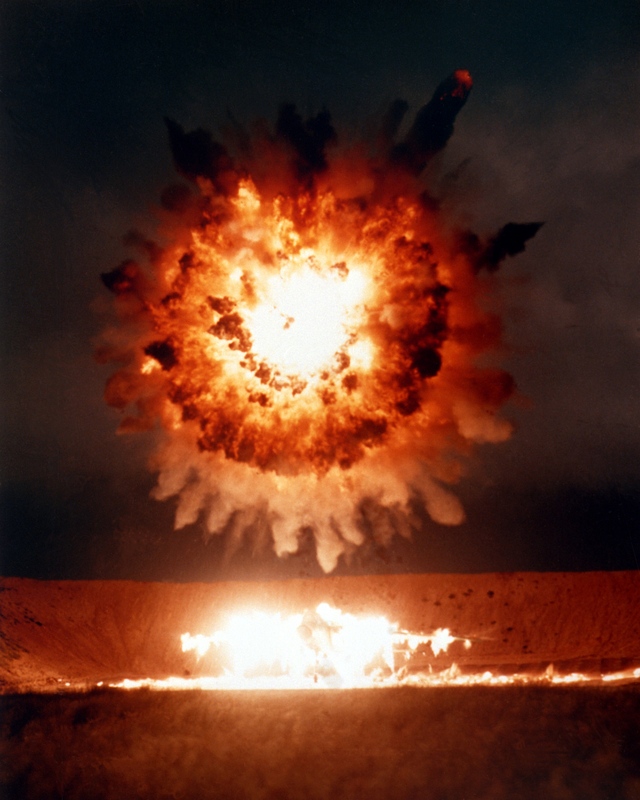 When the missile exploded, the expanding debris cloud from the vaporized weapon was probably moving faster than the speed of sound. Even so, in this second picture you can see none of it had touched the plane yet when the shot was snapped. Yet look at the plane: it’s on fire. How can that be? It’s because of something that moves much faster even than supersonic debris: light. When the warhead exploded, it sent out a huge pulse of heat in the form of infrared photons, light that travels about a million times faster than sound. As far as that flash of heat was concerned, the expanding debris was standing perfectly still! There was plenty of time for that heat to get to the plane and set it aflame before the explosion itself could reach that far. Note that third picture, taken from an oblique angle. You can match the features in the fireball to the ones in the second picture. The ground around the plane is lit up by the blast, and again no debris had yet reached the plane itself. It’s a little counterintuitive that the explosion works this way. We think of explosions as being made of expanding stuff, but it turns out that light has its role to fill as well. In fact, this is important in other ways: one idea to push Earth-crossing asteroids out of the way is to light off a nuke nearby. The force of the explosion itself isn’t all that great in space, because there’s no air to create a shock wave. The only momentum you give the rock directly is the expanding debris from the bomb itself, which isn’t all that much. But the blast of heat/light is immense, and can heat the asteroid past its vaporization point. The flash-vaporized rock expands, pushing on the asteroid like a rocket motor. Unfortunately, modeling of this shows it doesn’t work terribly well compared to other methods (like simply slamming the asteroid with a space probe like a linebacker hitting a quarterback). Still, you need to consider all the details when thinking about things like this. The devil hides in them, y’know! Oh, and one more thing. This Tomahawk test was done 24 years ago. How much has the technology improved since then?